Alex was born into a rich, southern food culture in Memphis, Tennessee. His childhood was spent around a boisterous table, learning simple but nourishing lessons in hospitality from his mother and grandparents. After graduating high school, he attended the renowned New England Culinary Institute in Vermont which propelled him into an abundant world of food and wine experiences. Alex sought out authentic cooking experiences, and cut his teeth traveling across the globe working at restaurants like Restaurante Martín Berasategui in San Sebastian, Spain, Manresa Restaurant in California, and Rosso de Sera in Valdobbiadene, Italy. Alex developed skills in pastry and baking in North Carolina and then at Splendido at the Chateau in Beaver Creek, CO, where he was the pastry chef for three years. 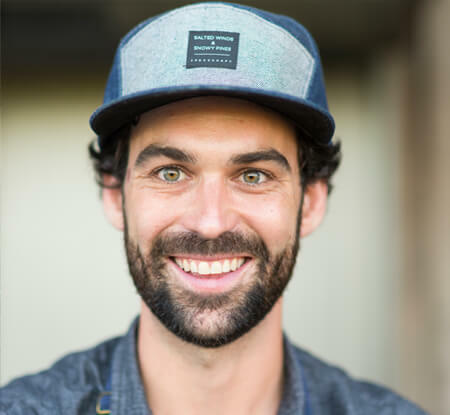 After several years of working in fine dining, Alex joined Mark Firth and the team at Prairie Whale in Massachusetts where their locavore attitude, farm to table dining concepts, and whole animal butchery re-ignited his love for cooking. Alex and his partner Maureen moved to Oregon in 2015 and Alex joined the Soter team as Head Chef in 2016. Soter’s Culinary Program has flourished under Alex’s guidance. His thoughtful food preparations highlight the abundance of Mineral Springs Ranch, and his style of cooking pays homage to each ingredient and its origins.